The New Gothic architectural style was introduced to Britain in the twelfth century and is characterised by the use of pointed arches, rib vaults, flying buttresses and by using spacious arcades to reduce walls to a minimum. The first completely Gothic building, the lower part of the east end of the Cluniac abbey of St Denis in Paris, dates from 1140-44. 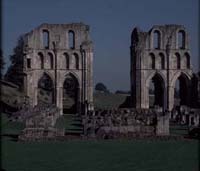 Roche Abbey was one of the earliest Gothic buildings in Britain.